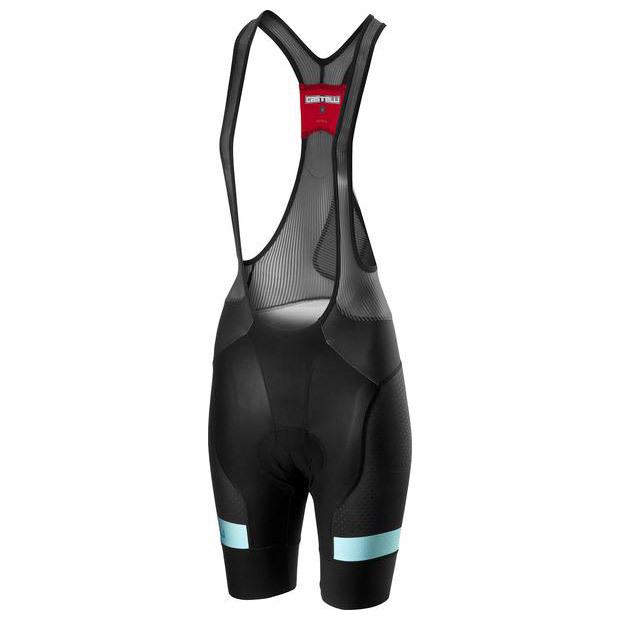 The Castelli Free Aero Race 4 Bibshort was developed in partnership with Team Sky and draws on 12 years of aero bibshort evolution to deliver riding perfection. When it came to improving on Castelli's best-selling bibshort of all time, the Italian brand's R&D team worked closely with Team Sky riders, visiting the squad in Belgium, Nice, Manchester and all around Italy to get training and racing feedback. 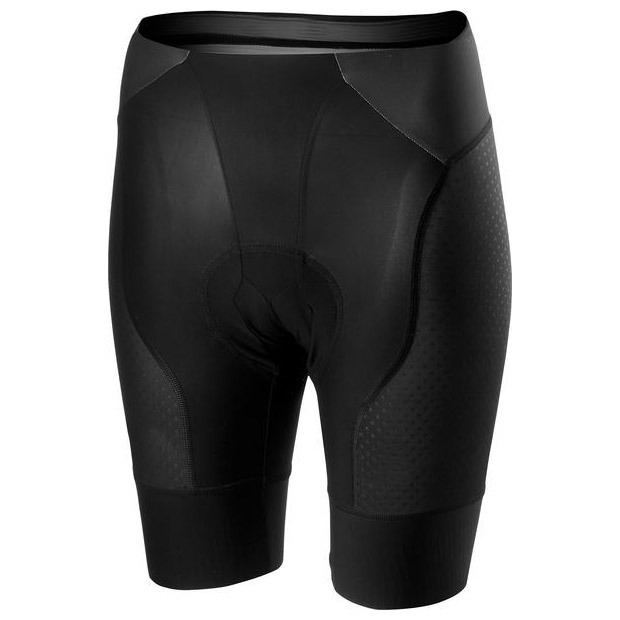 The consensus was that the existing Free Aero Race was already a really, really good pair of shorts. But Castelli isn't a company to sit still – good enough doesn't come into it. 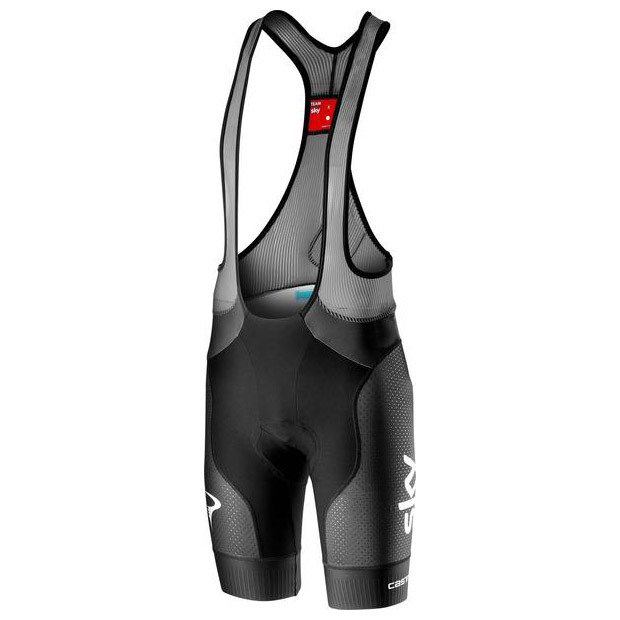 Based on Team Sky feedback and the Castelli team's constant testing and drive to improve on the short, the 2019 Free Aero Race 4 bibshort features some dramatic, performance-enhancing changes. New dimpling on the legs stops air attaching to the fabric so that air comes off cleanly – it also allows for better print quality too. There's a new leg gripper that features a lie-flat raw-cut edge but now has vertical silicone stripes to keep it in place without restricting stretch and leg movement. 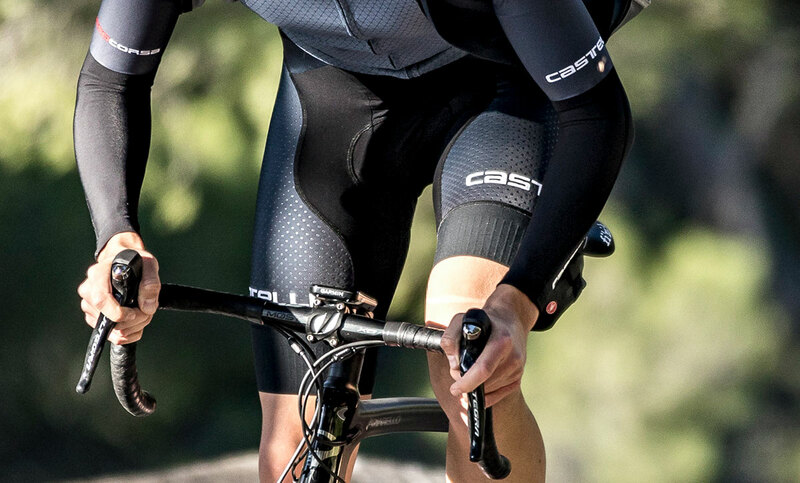 Castelli has completely redesigned the short's panelling to improve fit and support while also making the short look even cleaner. The team has re-engineered the bib straps with new lighter, more breathable material so they stay cooler, lie flatter and are more durable. They also look fantastic with a new pinstripe design. A new loop for race radio microphone was added at the request of team riders. The Free Aero Race 4 Bibshort also features Castelli's brand new Progetto X2 Air seamless seat pad, which features a two-piece design. Thanks to Castelli's advanced use of fabric technologies, the supportive foam core is slightly narrower and smaller than before. This is because the design's flexibility and elasticity mean it sits exactly where it needs to be – meaning it doesn't have to be wider than the saddle. The upper layer is dimpled to reduce full skin contact, encouraging air to drive moisture away from the body. It's also more elastic so it's doesn't fold while the finish is the softest ever on a pair of Castelli shorts for luxurious comfort next to the skin. 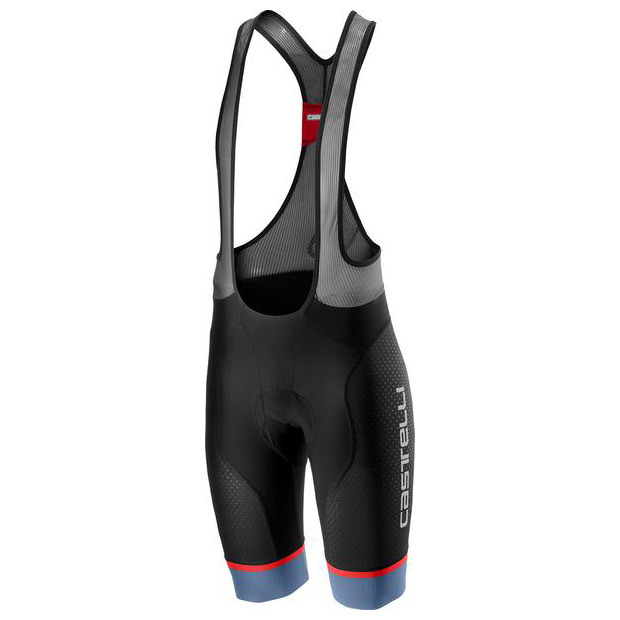 12 years in the making with millions of kilometres of pro peloton development, the Free Aero Race 4 is Castelli's fastest, most comfortable racing bibshort. 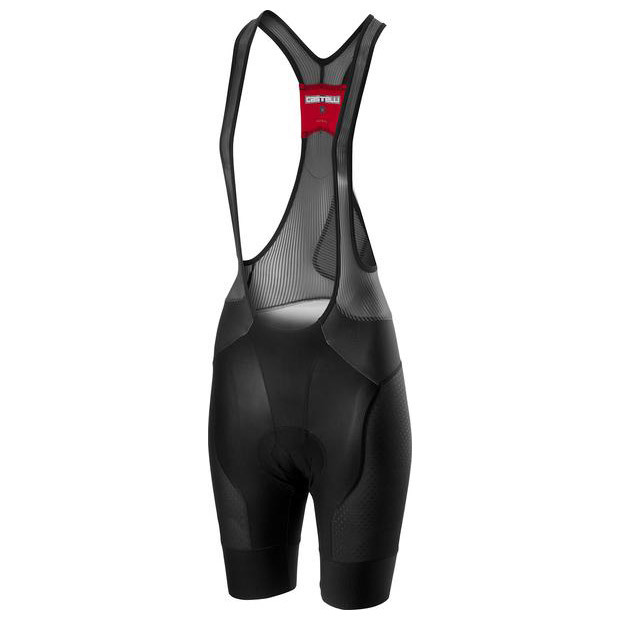 The new Free Aero Race 4 is the latest evolution of Castelli’s original Aero Race bibshort, which gave Castelli riders an aerodynamic edge in the peloton when it launched in 2007. The pros ride over 30,000km a year, so they're the ideal testers for Castelli and just as preoccupied with comfort and performance as enthusiast riders. More than a decade on from the original innovation of the Aero Race bibshort, Castelli’s close relationship with Team Sky athletes has once again yielded a performance advantage on the WorldTour scene – minimalism meets speed and comfort. 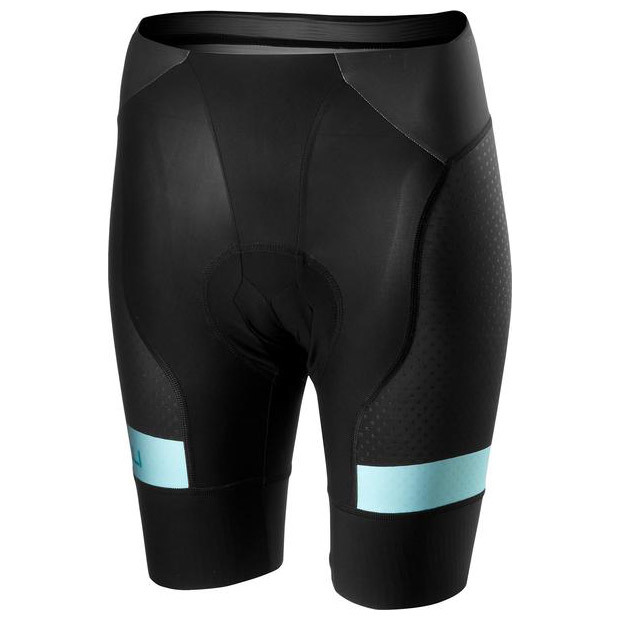 The result is the Free Aero Race 4, a pro-level short to be used by Team Sky in 2019 that's now available to all riders. The consensus was that the existing Free Aero Race was already a really, really good pair of shorts – but there were still gains to be made. As 'good enough' isn't part of the Castelli lexicon, the design team listened to every bit of feedback from Team Sky. Armed with this, along with Castelli's own constant testing and drive to improve on the short, the 2019 Free Aero Race 4 bibshort features some dramatic, performance-enhancing changes. The Free Aero Race 4 has been completely re-engineered to improve the short's performance without losing the spirit and clean lines that have made this peloton stalwart so popular. New Vortex dimpled fabric discourages air attachment so that it flows cleanly off the back of your legs while riding. This new design also allows for a better print quality too. 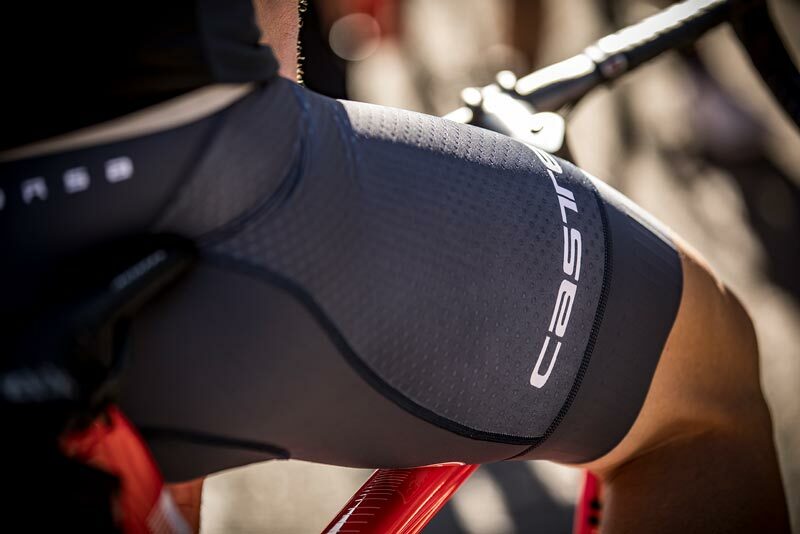 To ensure compression is only applied where needed, Castelli has overhauled the short's leg grippers. The new Giro4 design features a lie-flat raw-cut edge with vertical silicone stripes. This better distributes grip over a larger area to keep the hem in place without restricting stretch and leg movement. The inner legs feature Forza fabric for a smooth, snug, unrestrictive fit thanks to 38% Lycra content. Castelli has also completely redesigned the short's panelling with the new Doppio V construction improving fit and support while also making the short look even cleaner than previous versions. The Castelli team has re-engineered the Free Aero Race 4 bib straps with new lighter, more breathable material. This results in better moisture transfer to keep you cooler and drier while lying flatter for even more of a forget-it's-there feel. They're also more durable than ever before and feature a sophisticated new pinstripe design. There's a tidy lie-flat race radio pocket on the rear and a new loop for the radio's microphone was added at the request of team riders. The Free Aero Race 4 Bibshort incorporates Castelli's brand new Progetto X2 Air Seamless seat pad, which features a two-piece design. Thanks to Castelli's advanced use of fabric technologies, the supportive foam core is slightly narrower and smaller than before. 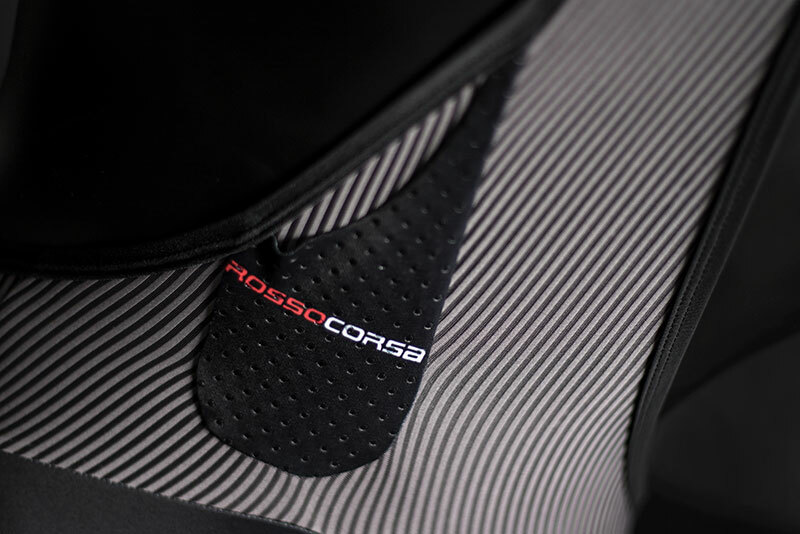 This is because the design's flexibility and elasticity mean it sits exactly where it needs to be – meaning it doesn't have to be wider than your saddle. The upper layer is dimpled to reduce full skin contact, encouraging air to drive moisture away from the body. It's also more elastic so it doesn't fold while the finish is the softest ever on a pair of Castelli shorts for luxurious comfort next to the skin no matter the length of your ride.